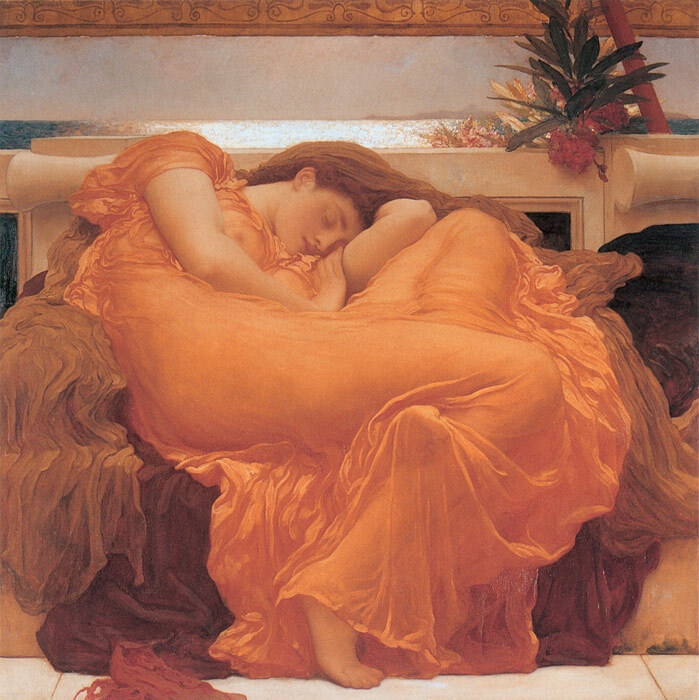 Flaming June is a painting by Frederic Leighton, produced in 1895. Painted with oil paints on a 47" x 47" square canvas, it is widely considered to be Leighton's crowning painting, showing Leighton's classicist nature. It is thought that the woman portrayed gestures to the sleeping figures the Greek would often paint which were collectively referred to as Venus, though likely due to the Victorian's prude nature towards sensuality, Leighton's model was fully clothed. Flaming June was auctioned in the 1960s, during a period of time known to be difficult for selling Victorian era paintings, where it failed to sell for its low reserve price of 140 USD. Afterward, it was promptly purchased by the Ponce Museum of Art in Puerto Rico where it currently resides. SPECIAL NOTE : The painter will make the reproduction as close to the original oil painting as possible. If you want your painting to alter from this likeness, please email us and " Flaming June, c.1895 " will be reproduced according to your special requirements.